P2P Vehicle Charging: Is blockchain a driver of EV adoption? Blockchain is an open, distributed, digital ledger that can record transactions between two parties efficiently and in a verifiable and permanent way. For use as a distributed ledger, a blockchain is typically managed by a peer-to-peer network collectively adhering to a protocol for validating new blocks. In simple terms, blockchain is a distributed database of transactions, which is managed by individuals who all own and store a copy of that database. For any transaction to be valid and ‘legal’, it needs to be verified by majority of individuals managing the database. Once the transaction is verified by majority, it is processed and added to the database and cannot be removed. 2017 was a year of tremendous growth for blockchain. The technology emerged with a potential to revolutionize various industries ranging from banking & finance to insurance, from land ownership to manufacturing. One of the most commonly talked about applications of blockchain, cryptocurrency, saw a strong increase in public interest and valuation with Bitcoin increasing its value by 1500% in 2017. For industry applications, Ethereum emerged as a very strong contender. In addition to providing a cryptocurrency (Ether), Ethereum promises to enable the use of blockchain in industry. Ethereum adds an additional layer of smart contracts, on top of existing blockchain, for peer-to-peer (P2P) transactions of any kind which would not require third party to overlook and validate. This feature has made Ethereum a viable “off-the-shelf” blockchain implementation solution to use. One of the recent applications of blockchain based P2P smart contracts is P2P electric vehicle (EV) charging, which is starting to grow quickly. A key challenge to widespread adoption of electric vehicles (EVs) is range anxiety. Significant EV prospects have this fear of running out of battery power on large distance commutes where there is no electric car charger available. Long distance trips have to be planned carefully to ensure availability of charging stations and charging time needs to be built in the commute. Lack of easy availability of charging infrastructure compared to fossil fuel is often a key deciding factor for vehicle buyers. More and more efforts are being made to install charging infrastructure. Installed base of various types of chargers is increasing globally in high EV concentration countries. An alternative solution is emerging to tackle this lack of charging infrastructure. Blockchain based applications are enabling individuals to share their private EV chargers with others. Using P2P EV charging platforms, private owners can make their chargers available for public during the times they are not being used by them. In return they can earn some cash on the side from their idle charger by increasing its utilization. Drivers of EVs can, at any location, look for available chargers in the vicinity and charge their cars before they run out of battery power. A lot of companies have already taken their solutions to market and have acquired initial users. Share&Charge platform by the German firm Innogy Innovation Hub enables you to share your charging station via a mobile phone application and lets the EV drivers find charging stations in their area. Share&Charge already has more than 1200 private charging stations registered in Germany available to EV drivers. In California, eMotorWerks is the first USA based company bringing P2P EV charging to the market with its proprietary JuiceNet-enabled EV charging solutions. Some other companies and initiatives offering P2P charging solutions using blockchain based platforms are Oxygen Initiative, Easy Park, Chargemap, Aerovironment and Charg. Business models of these companies vary a little from each other, but they all are providing part of P2P EV charging solution. Enabling consumers to make their chargers available for public use for a fee can significantly increase the number of available charging locations. With minimum to no investment, just by utilizing existing infrastructure which would have been idle otherwise, P2P charging can make charging stations available everywhere. Hence eventually reducing range anxiety and promoting a higher adoption of EVs. This approach can also offer an indirect competitive advantage to new EV manufacturers as availability of commercial charging stations specific to car manufacturers, e.g. Tesla, is a significant advantage large manufacturers have due to their existing investments in the infrastructure. Availability of private charging infrastructure can open doors for new entrants to the market as well e.g. Byton. In the future, there is a potential of including P2P charging as a feature of P2P energy sharing platforms as part of broader smart grid implementation. It would enable the use of EVs for Vehicle-to-Grid (V2G) applications e.g. peak shaving support at the time of high grid electricity requirements, or providing added storage in case of excess generation from renewables during certain time of the day. Solutions integrated with two-way chargers can expand the horizon of EVs. 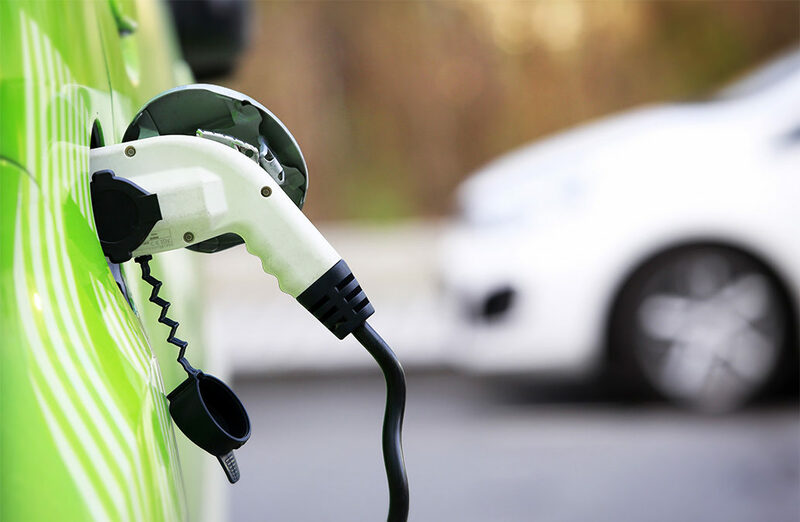 By solving range anxiety and allowing new manufacturers to compete in the market, P2P charging can certainly act as a key driver of high EV adoption in years to come. One thing to be considered though is that P2P charging is an attractive solution in short to medium term only. With more and more money being invested in the commercial EV charging infrastructure, in medium to long term, there will be significantly more commercial chargers available (CAGR 2014-2020 charging infrastructure market globally is expected to be 52%). EVs will be able to charge their batteries as quickly as possible with commercial chargers as opposed to normally slow private charging infrastructure. This can reduce the need of private chargers in the future. How the market exactly develops, and how charging business models further evolve still needs to be seen. For now, blockchain is certainly going to act as a driver of increased EVs through P2P charging of electric cars.